Escape Your Worries, Drifting in Elegance! Escape your worries and cares with the Drift + Escape U-Seat Inflatable Lounger. The U-shaped body of this tropical-themed pool lounger is supportive and comfortable, making your pool a relaxing paradise. The durable PVC bladder is covered in a soft colorfast polyester fabric, making this U-Seat your go-to lounger for many years to come. As you relax, suspended in the cool water of your pool, enjoy your favorite island drink. It will always be close at hand with the built-in cup holder. Enjoy the benefits of the high-end Drift + Escape float line this summer in your own U-Seat Inflatable Lounger. Contoured for all-day comfort, the French Classic is perfect for the serious lounger. Its integrated backrest and roll-style headrest keep you comfortable. And the water hole built into the leg area lets you dip your legs for a quick soak. The tufted french pockets trap water to help keep you cool while you're relaxing. 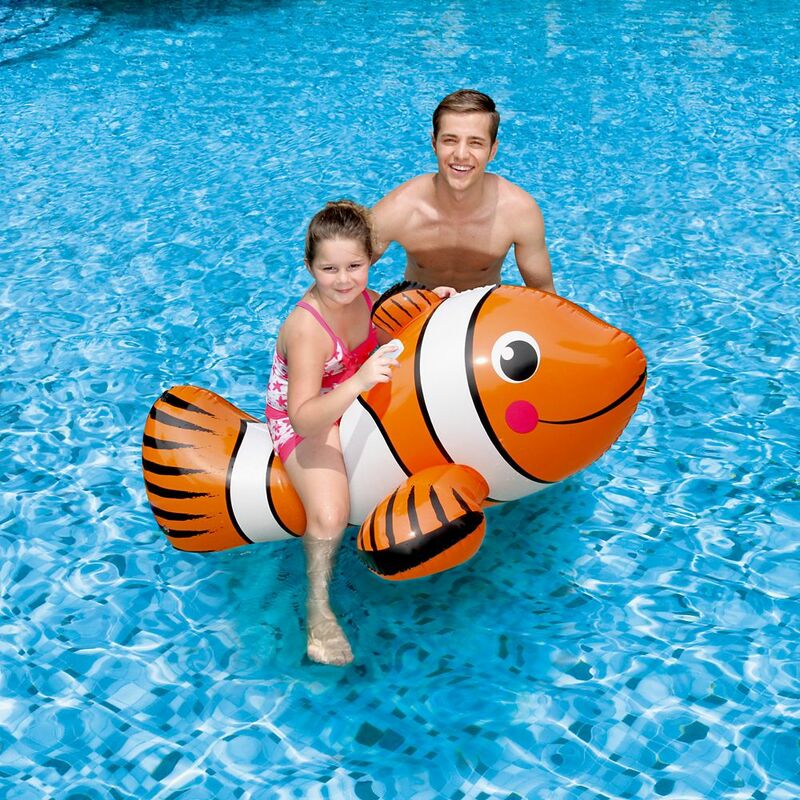 Clown Fish 67-inch Inflatable Ride-On Pool Toy Kids will love to hitch a ride on everyone's tropical favorite, the clown fish! This big, colourful Clown Fish Inflatable Ride-on Pool Toy measures a full 67-inches and features two grab handles. The heavy duty vinyl is built to last. The Clown Fish Ride-On will make a big splash at your family gatherings. Clown Fish 67-inch Inflatable Ride-On Pool Toy is rated 5.0 out of 5 by 1. Rated 5 out of 5 by GRTGRAM from CLOWN FISH 67 IN INFLATABLE POOL TOY THE PRODUCT WAS FOLDED UP AND PUT IN IT'S MAILING BOX. IT WAS A GIFT AND WOULD HAVE BEEN NICER IF IT HAD OF BEEN ENCLOSED IN A PLASTIC BAG BEFORE INSERTED IN IT'S MAILING BOX.IT WAS AN EASTER GIFT FOR MY GREAT GRAND SON AND HE LOVED IT.